30-JAN-2007: Added a diode limiter in the feedback path. This spring reverberation unit comprises three identical main sections each of which contains an Accutronics type 9 spring reverb tank with short, medium and long decay times. Controls are provided to adjust the amount of signal arriving at the output from the input directly and from the spring tank. Conventionally these signals are called "dry" and "wet." A feedback control allows the tank output to be returned to the tank input to produce oscillation effects. The amplified output from the spring tank is available on a socket to send to other effects units and an insert input socket is provided for the return from that effect. The insert socket overrides the signal from the tank output. This return is prior to the feedback control so that the effects unit is within the tank feedback loop. In this way a frequency shifter could be used in the send-return loop to provide rising or falling reverb effects. 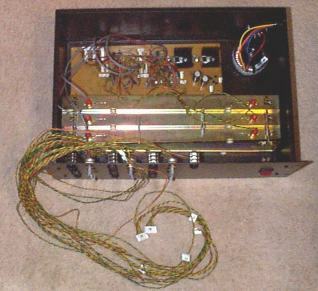 The Accutronics type 9 is the best unit made by that manufacturer and is considered to be a high quality spring reverb used in many respected products. Inputs are insert-switch daisy chained to allow input 1 to feed inputs 2 and 3 if there are no plugs inserted in inputs 2 and 3. One additional SuperVerb(tm) output which is a sum of the three main outputs for extra rich reverb. +/-13.8V supplies on rear panel screw terminals to supply power to other synth units. Other simple synth modules might be installed in this case to use up space on the front panel. A separate compressor may be included later to produce 1960s style post-attack increasing reverberation. This sheet shows the three tank drive circuits. These are simple class B drivers driven from the TL074 outputs. The ground side of the tank input transducers returns to ground via an 8.2Ohm resistor. This provides the first stage of frequency response shaping by making the mainly inductive tank input transducer look more resistive. The tank has an impedance of approximately 10Ohms at 1KHz which is mostly inductive. With the 8.2Ohm resistors the current in the tank driver will be about -3dB at 1KHz and reducing at approximately 6dB per octave above that frequency.Taking the feedback for the op-amp/driver combination from the top of this resistor makes the driver a constant current circuit, so the output swing will increase as the impedance of the tank transducer rises at higher frequencies. This continues up to a certain frequency defined by the capacitor in the feedback circuit. The current drive is rolled off above about 7kHz as the tank mechanical response rolls off rapidly much above 6kHz. Extending the drive bandwidth higher would be useless and result in lots of unnecessary current circulating around the circuit at 15 or more kHz. Stability of the circuit is very good despite the phase shift created by the inductive load above 1kHz. This circuit requires the use of the tank version with isolated input transducers. Using this circuit with the sense resistor grounded also allows for easy single-ended measurement of the drive current. This sheet shows the low noise pre-amp circuits for the tank output transducers, voltage gain stages and the output socket drivers and summers. The dual PNP transistor differential input stages with the op-amp feedback are a standard circuit with the operational currents set to minimise noise at the nominal input impedance of 2kOhms. The 100nF input cap and the dominant 22kOhm bias resistor form a high pass filter to eliminate deep bass rumble from vibrations in the spring tank. The 2.2nF input cap reacts with the tank impedance to roll off the frequency response above 8kHz and to limit the noise bandwidth. Gain is set by the op-amp feedback divider which is low impedance to reduce noise in the feedback transistor. The input amplifiers are a.c. coupled into a further op-amp stage which brings the signal back to the level at which it entered the front panel input sockets. This is presented at the effect send sockets. While using the unit I found that the reverb controls produced a useful effect but it was very easy for the feedback to build up to a point where the oscillation level was very high and clipping excessively. This was risking possible damage to the tank input transducers and so subsequently I have added simple diode limiters after each of the feedback control pots. With a small adjustment to the subsequent gain setting feedback resistors, there is still enough gain round the loop to ensure a swift build-up to a feedback oscillation, but the excessive signal levels are avoided. These are standard regulated power supplies, with quite a large transformer, reservoir capacitors and heatsinks to allow enough power for the tank drive circuits and some external supplies to other synth modules in the stack. On the main signal inputs, wires from socket 3 connects to input 2 when there is no plug inserted in 3. Input wires from socket 2 connects to socket 1 when there is no plug inserted in 2. In this way a plug in socket 1 connect to all three inputs if there is nothing plugged into the others. This can be useful to save patch leads when it is desired to send the same signal to all three sections. The effect send outputs connect back to the switched terminal on effect return when there is no plug inserted in the effect return. This is the main signal path when an external effects unit is not being used. Most of the wiring loom to the front panel is disconnected here, with just the tank drives and returns plugged in. 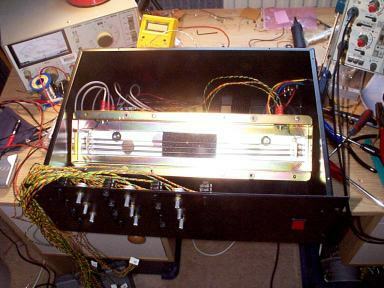 The whole box from the top showing the three tanks bolted together and the front panel wiring disconnected. The mains wiring and ground bonding is incomplete in this picture. View with the open side of one of the spring tanks showing the three springs and the piece of foam stuck behind them to stop them banging around when the tank is dropped. These tanks only just fit in a 19" rack case.